A blocked chakra means energy is stuck or hindered. You might think of it as a blocked artery. In order for energy and information to flow, the channels through which they flow must be open. You will have difficulty getting to work on time if the roads are blocked by traffic. In the same way, the chakras cannot work at optimal levels when the pathways have blockages. These blockages can be physical, emotional or psychological, spiritual, karmic, or energetic. The blocks can be physical, in the literal sense, such as fatty deposits in the arteries, a tumor, a cyst, or excess waste. We can create blockages in the physical body through poor dietary choices, lack of exercise, overexertion, and lifestyle choices such as overwork, drug use, or lack of sleep. Blocks in the chakras can also be emotional or psychological, such as stored emotions from the past or mental illness such as anxiety, depression, or addiction. We accumulate emotional toxins and residue from not properly processing and digesting emotions and experiences. These toxins result in blocking the energy flow of the chakras. Blocks can be spiritual in nature. They can come from outside spiritual forces or from within. If we refuse to honor the spiritual side of who we are, we block the higher chakras. Being spiritually rigid and strict can also restrict the flow of energy. Remember, whether the forces are external or internal, without your conscious awareness they can create harm. Blockages can also come from our karma. The word karma in Sanskrit literally means “action.” In life we perform actions that are good or nourishing, bad or harmful, or neutral. An example of a good action might be giving money to charity. A bad action might be intentionally lying or deceiving. A neutral action might be making the bed (which, if you dig deeper, can also be considered a good action, depending on the circumstances). In the East, certain religions and philosophies adhere to the principle that we accumulate karma throughout lifetimes, and we carry it forth into our current life. The definition of karma, in this sense, assumes a belief in reincarnation and asserts that karma is not simply the action performed but also the consequences of that action. Good karma carried forward can give us favor in our current lifetime. Bad karma is a debt we must repay in this or future lifetimes. Whether or not you believe in reincarnation or the explanation of karma, you can learn to appreciate and grasp the concept. Have you ever heard anyone say that they constantly suffer from bad luck? The bad luck may be more about paying back a karmic debt of which they aren’t even aware. You’ve surely heard the adages “What goes around comes around” and “You reap what you sow.” These expressions explain the essence of karma. Often, in our minds, karma has negative connotations. But note that you can accumulate good karma through good actions or service to others. Finally, the blocks can be energetic. I explained a little about energetic blockages when I spoke about my astrological chart. We are a part of this earth, our solar system, and the universe. The influence of the earth’s energy and elements, as well as of the energy of the sun, moon, and planets in our solar system, is strong and undeniable. Ayurveda, the five-thousand-year-old medical system from India, recognizes these energetic forces and acknowledges them as a means of healing. You can learn more about Ayurveda by reading my book The Wheel of Healing with Ayurveda: An Easy Guide to a Healthy Lifestyle. Ayurveda works on the principles of the five elements — space, air, fire, water, and earth — which work together to create the three doshas, or mind-body types, of Vata (space and air), Pitta (fire and water), and Kapha (water and earth). These elements and mind-body types are relevant in recognizing energetic blocks within your body and the chakras. This awareness will give you more tools toward your healing of the chakras and provide a superspeed highway to creating energy flow. In any spiritual practice, awareness is the first key to awakening. When you come out of a holiday, realize that you can’t fit into your jeans, and get on the scale, you become aware that you may need to lose weight. Without this awareness, you will do nothing to change. Awareness means coming out of the dark and stepping into the light. Most often awareness is for our greater good at the time it’s revealed to us. Yet we are sometimes afraid of what we might find. Awakening can mean we find ourselves in a place where we don’t want to be. Awareness can mean we now see the mess we must clean up. Sometimes our friend awareness comes as a slap on the face that doesn’t feel too good. Then our friend denial comes in and coaxes us back to what feels good but may not be right. You are human. You have a physical body, an emotional body, and an energetic body. You are also a spirit with a spiritual existence that is currently bound by a body. Awakening can come only when we accept the entire package. Yet our other friend, the mind, also comes in and tries to convince us that one way is better than another. For example, the mind tries to say, “If only you had better parents, you might be in a better financial situation.” Then the ego comes along and adds its two cents: “Yeah, and if your boss treated you better, you might have gotten that raise you deserve.” So all these parts create who you are, and balance comes from accepting every part. As you work through the chakras, things will come up. Grievances, hurt, past afflictions, and present discomforts will arise and make themselves known to you. This is a good thing and what you want for healing. You certainly don’t have to accept them right away. Just make yourself aware of them. Notice them. Say hello. Watch them as you would a movie on a screen. Sometimes awareness alone will heal that which ails you. 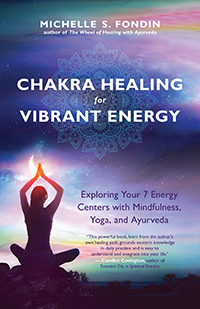 Michelle S. Fondin, author of Chakra Healing for Vibrant Energy and The Wheel of Healing with Ayurveda, is an Ayurvedic lifestyle counselor and a yoga and meditation teacher. She holds a Vedic Master certificate from the Chopra Center and has worked with Dr. Deepak Chopra teaching yoga and meditation. Find out more about her work at www.michellefondinauthor.com. Excerpted from the book Chakra Healing for Vibrant Energy. Copyright © 2018 by Michelle S. Fondin.